David Murray, as well as his partners in the World Saxophone Quartet, have devoted considerable time recently to concept projects, most recently a Latin big band effort and a Hendrix tribute, respectively. Two years ago Justin Time released Yonn-De, Murray's original collaboration with the so-called "Gwo-Ka masters" of Guadeloupe. The new Gwotet represents a (rather vast) extension of the Gwo-Ka masters project, so much so that it left me scratching my head and returning to the archives to check out the original anew. It doesn't bear too much in common except the return of the aforementioned masters (Klod Kiavue and Francois Ladrezeau) and a similar dedication to the subterranean African roots that inform the music of the New World diaspora. Where Yonn-De was almost ritualistic in nature, Gwotet has an air of jam sophistication. It's bigger (fourteen players credited), brighter (eight horns), and more densely intertwined. 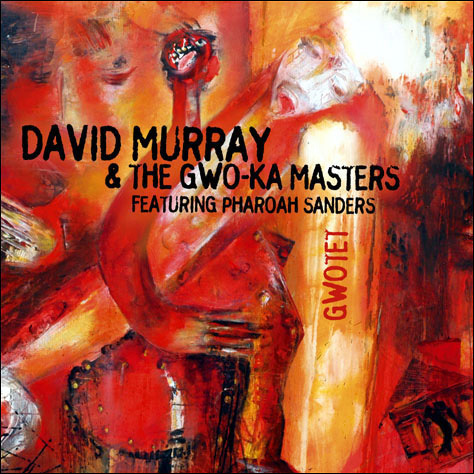 Most of all—and this ought to be a shock to listeners familiar with the earlier Gwo-Ka record, it's funky as hell. Truth. Along with the other unexpected surprises comes Pharoah Sanders and his tenor saxophone, a suitable complement to Murray's own outspoken voice. Murray sounds articulate but not bombastic; Sanders conveys a boldly simmering spirit with an distinct edge of his own. Some of the music suggests dance ("O' Leonso," after a somewhat out-of-place solitary guitar introduction), other parts spacious abstraction ("Go To Jazz"), but most of it sticks to a regular groove and draws from the strength of all those horns and drums. And there are more than a few moments of unbridled intensity. Where vocals appear, they serve the music and not vice versa, and where solos appear, the band serves the soloist and not the other way around. For listeners attuned to deep Africa who keep an ear half-cocked for funk, this is a no-lose proposition.